Weekly specials advertised in the restaurant. Urban Diner (@UrbanDinerYEG) has been a staple of Edmonton’s High Street area for as long as I can recall. But, it wasn’t until I was probably finishing high school or working on my undergrad that it became one of my hang outs. For several years now, it has been the brunch location of choice for my elementary school friend and I. The prices are decent, the food is simple, yet tasty, and it’s good for a casual gathering. There’s nothing pretentious about this place. I have heard a few people gripe that the offerings have gone down hill recently, and that the consistency of the dishes between the original 124 Street location and the one on 109 Street just south of the High Level Bridge is questionable. However, the long line up of patrons waiting for tables – seen each Saturday and Sunday morning – tells me another story. It’s obvious that the diner is still a favourite when it comes to breakfast food and home style meals. Regardless of the weather or traffic caused by the closure and construction of the Groat Road Bridge, people will patiently bide their time until a spot frees up. My last visit was no different. 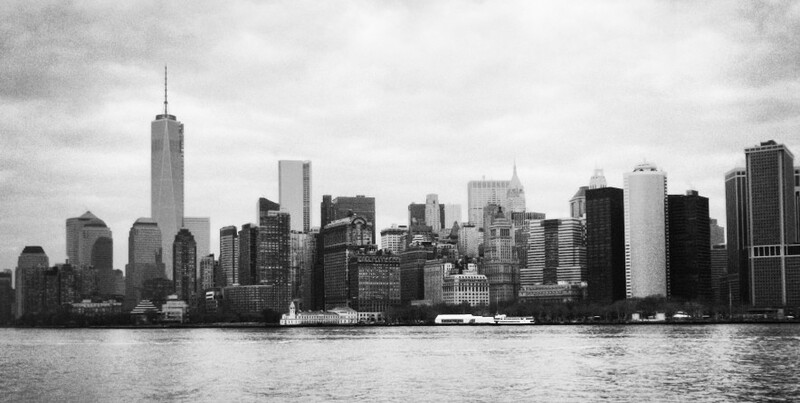 Months since I’d been there, I arrived a little late, but a bit earlier than my friend. Already, there were a few pairs and groups ahead of me. Everyone was trying to crowd inside the door way, some to no avail. All the tables and the counter seats were full, but I could see some people finishing up, so I knew it wouldn’t be too long. As I waved and smiled at a baby being cradled in his mom’s arms, I watched as the servers hustled around the eatery wiping down surfaces, clearing plates and dropping off food. Some of the servers I remember seeing on previous occasions. Many of them have likely worked there throughout my entire history as a customer. Personally, I think that speaks to the business itself. The fact that their staff has stuck with them for such an extended period of time, hints that they must be doing something right. 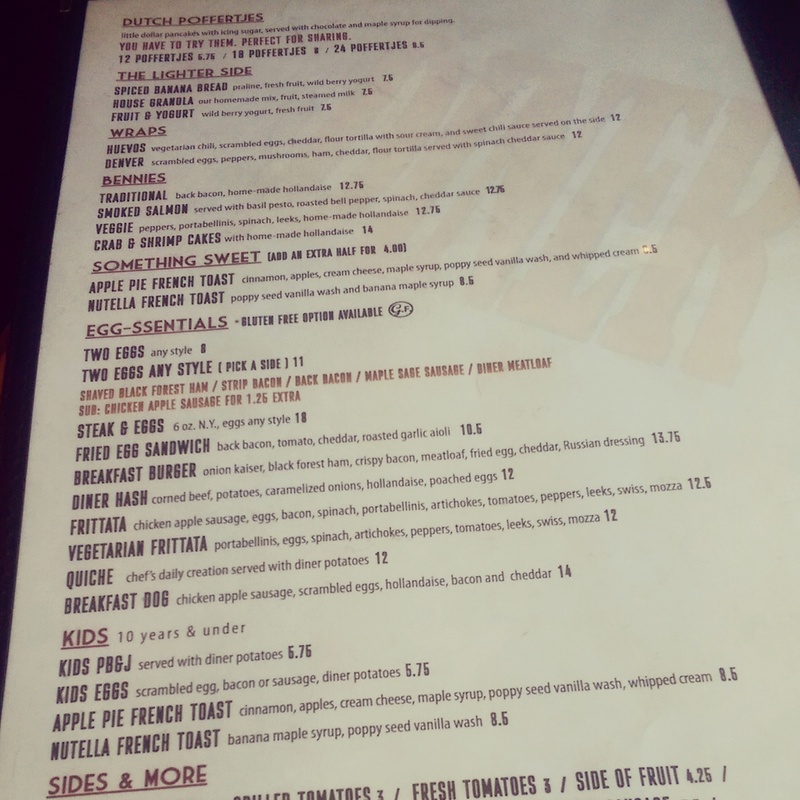 The Urban Diner brunch menu. Shortly before my companion showed up, I was led to a table by the window. I still had a view of the door, and the line certainly wasn’t letting up soon. Our server grabbed me a water as a text came in; my friend was just about there. I perused the menu and glanced at the daily deals (FYI, mac and cheese Mondays are no more. 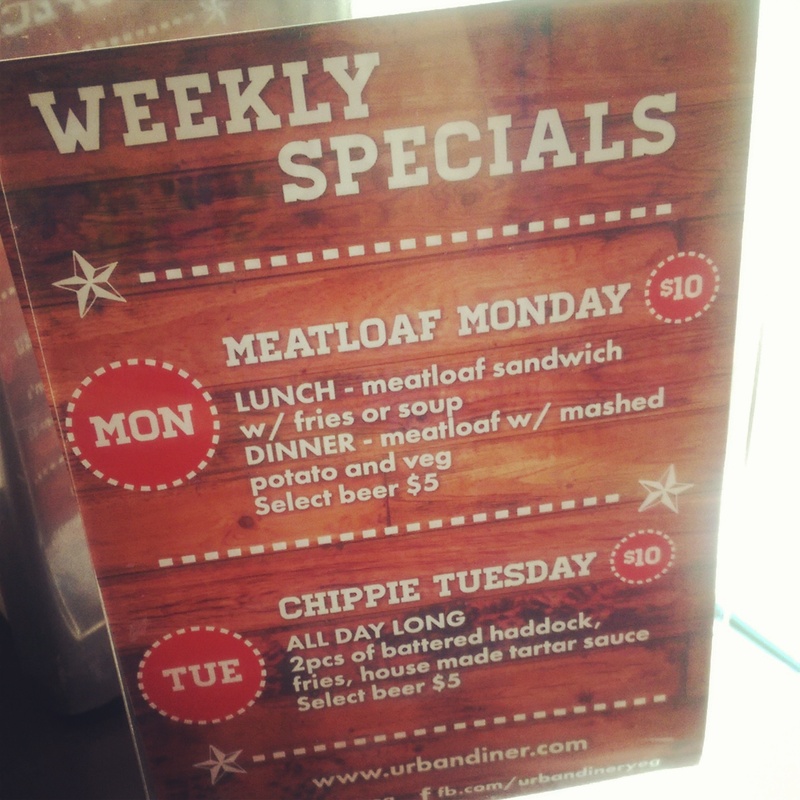 That has moved to Thursday, while meatloaf now starts the week off.). Regardless of whether my heart is set on something or not, I make a point of studying the choices. Maybe they’ve swapped some items off the menu, or another selection will strike my fancy. You never know. 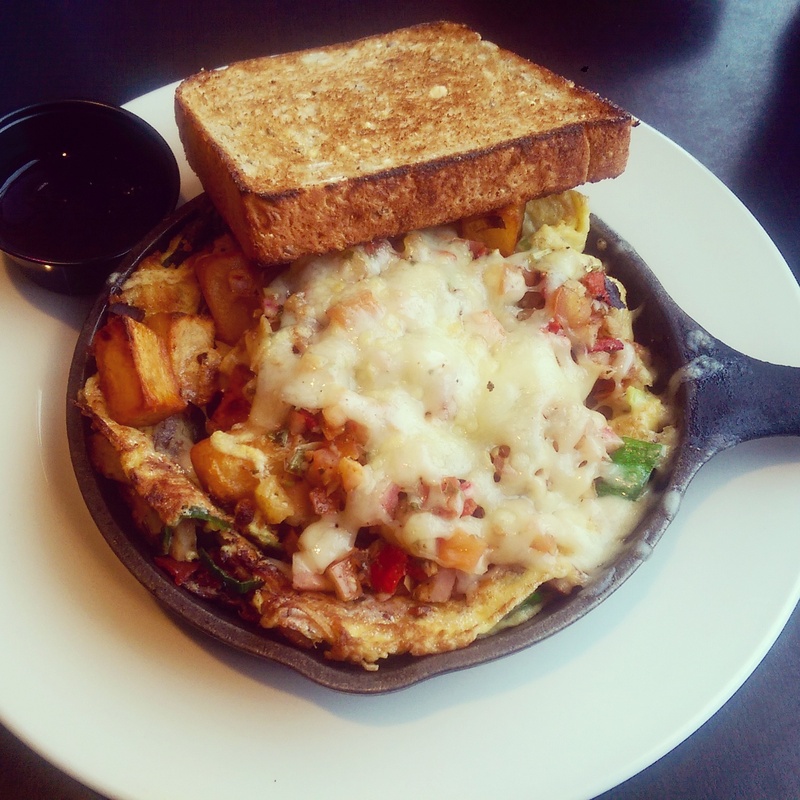 The frittata with multigrain toast. Not this time, though. Both of us stuck to the tried and true – frittatas! I used to go for the vegetarian frittata (sans the chicken apple sausage), but nowadays, I’ve been selecting the meat option. I suppose, it just feels heartier that way. A skillet of eggs, bacon (not in the veggie version), spinach, portabellinis, artichokes, tomatoes, peppers, leeks, hash browns, swiss and mozzarella, whatever option you choose, they’re both extremely satisfying and filling. It’s a dish with ample flavour and a good ratio of meat to veggies to cheese to starch. The plate also comes with your choice of toast and a pot of berry preserves, which is likely unnecessary, yet provides some sweetness to an otherwise savoury offering. 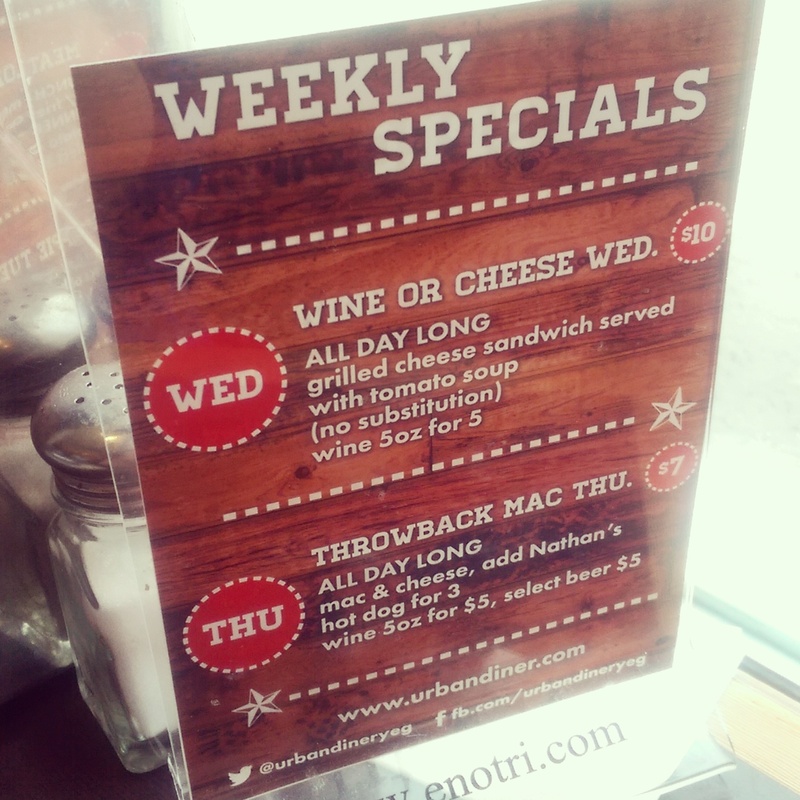 More weekly specials, including Throwback Thursday Mac & Cheese! I will have to go back at some point for the Throwback Thursday all day mac and cheese special, which is only $7 (add $3 for a Nathan’s hot dog). I have a feeling they stopped serving the smoked salmon and curry versions of the mac and cheese that used to be part of their Monday menu after 5pm. Of course, I can’t say that for sure until I actually try it, but that’s my best guess based on the cost and their suggestion of topping it off, old school style, with hot dog pieces. Their retro dessert case always looks full of great after dinner treats, too. One day, maybe I’ll leave enough room to fit that in. All I know for sure, is that if Urban Diner decides to stay, people will continue to flock to it. They have a great reputation that has been ingrained into the city’s dwellers and its surrounding neighbourhoods. And, as far as I can see, they’re still serving up the same food that my friend and I have come to love, if not for the food itself, for the memories that the dishes bring back. It’s our spot, and hopefully, it’ll always be there when we need to catch up.